The Five Moons are five Native American ballerinas from the U.S. state of Oklahoma who achieved international prominence during the 20th century. They are Yvonne Chouteau, Rosella Hightower, Moscelyne Larkin, and sisters Maria Tallchief and Marjorie Tallchief. 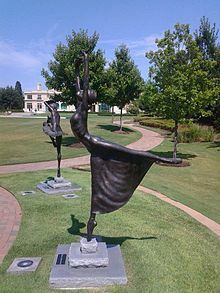 Five Moons (2007) is the name of a bronze sculpture installation in Tulsa, Oklahoma, that portrays the five ballerinas. Yvonne Chouteau (Shawnee Tribe, 1929-2016), grew up in Vinita, Oklahoma and her tribe, the Shawnee Tribe was part of the Cherokee Nation but is now independent. At age 14, she became the youngest dancer to be accepted by the Ballet Russe de Monte Carlo. She and her husband Miguel Terekhov founded the Oklahoma City Civic Ballet, now known as Oklahoma City Ballet. Rosella Hightower (Choctaw Nation, 1920-2008), was born in Durwood, Oklahoma. She studied ballet in Kansas City, Kansas and New York. Hightower first danced for the Ballet Russe de Monte Carlo and several other companies. She founded the Center for Classical Dance in Cannes, France and was the director of the Marseilles Opera Ballet, the Ballet de Nancy, and the Ballet de l'Opéra National de Paris. In 1975, she garnered France's premier honor, the Chevalier de la Légion d'Honneur. Moscelyne Larkin (Peoria/Eastern Shawnee/Russian, 1925-2012) was born in Miami, Oklahoma. Her mother personally trained her in ballet until she moved to New York to continue her studies. Larkin joined the Original Ballet Russe at age 15, and later danced for the Ballet Russe de Monte Carlo. She moved to Tulsa, Oklahoma with her husband Roman Jansinsky, where they founded the Tulsa Ballet Theatre. Maria Tallchief (Osage Nation, 1925-2013) was born in Fairfax, Oklahoma. Her family moved to Los Angeles, California to give her and her sister the best ballet training. She joined the Ballet Russe de Monte Carlo and later the New York City Ballet. She married its director and choreographer George Balanchine, who created ballets for her. Marjorie Tallchief (Osage Nation, born 1926) is Maria's sister. She grew up in Fairfax, Oklahoma. She became the first Native American premiere danseuse étoile in the Paris Opéra. Tallchief danced in a number of ballet companies and was director of dance at the school of the Dallas Civic Ballet (later renamed the Dallas Ballet) Dallas; the City Ballet of Chicago; and the Harid Conservatory of Boca Raton, Florida. Two of the Five Moons sculptures at the Tulsa Historical Society. From left to right: Marjorie Tallchief, Rosella Hightower. The ballerinas inspired other forms of art. A ballet entitled The Four Moons was created for the Oklahoma Indian Ballerina Festival in 1967. The ballet, set to music by the Oklahoma native Louis Ballard, a Quapaw-Cherokee composer, consists of four solos that evoke each dancer’s tribal heritage. The Osage solo is dedicated to both Tallchief sisters, thus explaining The Four Moons title, as opposed to five. Chickasaw artist Mike Larsen painted a mural depicting the Five Moons, entitled Flight of Spirit. The mural hangs in the Oklahoma State Capitol Rotunda in Oklahoma City. One of the last paintings by Muscogee Creek artist Jerome Tiger was The Four Moons, used for the cover of Louis Ballard's ballet program. The 1967 distemper and casein painting features Chouteau, Hightower, Larkin, and Marjorie Tallchief in a range of dynamic dance positions with four stylized moons, on a solid blue field. Lili Cockerille Livingston wrote a biography of the women, entitled American Indian Ballerinas,. She excluded Moscelyne Larkin Jasinski from the book at her request. Three of the Five Moons sculptures at the Tulsa Historical Society. From left to right: Maria Tallchief, Yvonne Chouteau, Moscelyne Larkin. The Five Moons sculpture was unveiled at the Tulsa Historical Society in November 2007. The sculptures present each of the women in a costume and pose representative of one of their signature roles. The project was begun in 1995 by artist Monte England. England, inspired by Mike Larsen's mural, desired to create a tribute in bronze to the ballerinas in his hometown of Tulsa. Sponsorship of the project was provided by Tulsa Historical Society and the Tulsa Ballet, whose representative monitored the project to help England ensure that details such as hand position and dress were accurate. In 2005, however, England died, having completed only two of the full-sized sculptures. England's long-time friend and fellow sculptor Gary Henson was asked to complete the project. Henson was provided license by the Ballet and Historical Society to complete the remaining sculptures in his own style, which differed slightly from that of England. ^ Anderson, Jack (January 9, 2012). "Miguel Terekhov, Dancer With Ballets Russes, Dies at 83". New York Times. Retrieved January 28, 2011. ^ Livingston, Lili Cockerille. American Indian Ballerinas. Norman: University of Oklahoma Press, 1999: xix. This page was last edited on 13 February 2018, at 23:45 (UTC).